Stoke Potters avenged their defeat to Sheffield Saints on Thursday with a 49-41 home victory over the National League leaders on Saturday. The Potters trailed 19-17 after six races and led by only two points after 12 of the 15 heats at Loomer Road. 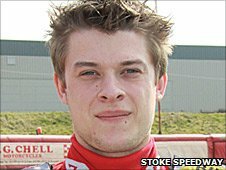 But Stoke won the remaining three heats to secure a three-point win. "We were disappointed not to get anything on Thursday and wanted to make amends here tonight," said Tim Webster, who scored 13 points for the Potters. "I'm pleased we have done that tonight against a quality side." Team manager Malcolm Vasey added: "That was a superb effort from every one of our riders. "At one stage during the meeting I'd have settled for just a win, but the team showed a lot of spirit to gain all three points."